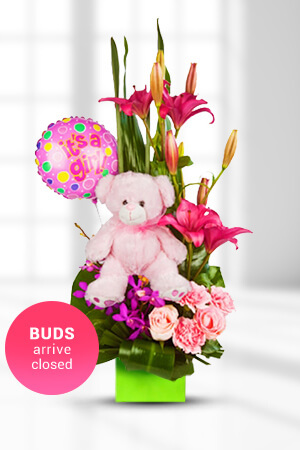 The flowers delivered were very nice and sent on time. Thank you. I ordered a pink Teddy Bear but a brown bear was sent instead. On time and great quality! Can't ask for more...Keep up the great work! The balloon and teddy bear with the flowers made this a great gift for my granddaughter. Will definitely use your company again.